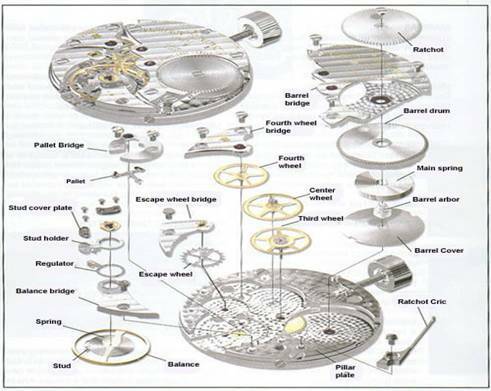 I recently (December, 2012) became interested in learning how mechanical (spring driven) watches work after reading the book "Longitude" by Dava Sobel. The book tells the story of John Harrison (1693-1776) (and his son William) and the clocks H-1, H-2, H-3, and H-4 that they built. Long ago (when I was a young boy), I received a gift which consisted of a set of small tools and a watch movement. I never did learn how it all worked at the time, but I greatly enjoyed taking it all apart and learned a lot about manipulating tiny mechanisms. As you might imagine, watch collecting can be an absorbing interest, and many are head over heels into it. My interest is first and foremost in understanding how watches work, and while I do want to own a few watches, I want to avoid the collector compulsion. (There is a book "Collecting, An Unruly Passion", written by a psychiatrist - that I have yet to read, but feel I can predict some of the conclusions from the title). I don't like to wear anything on my wrist, so pocketwatches are a natural alternative. On top of that, they are fascinating - and a window into the first half of the 20th century (at least that is the period that most interests me). For some reason watch repairers are often called "watchmakers" even though they do not actually make watches.